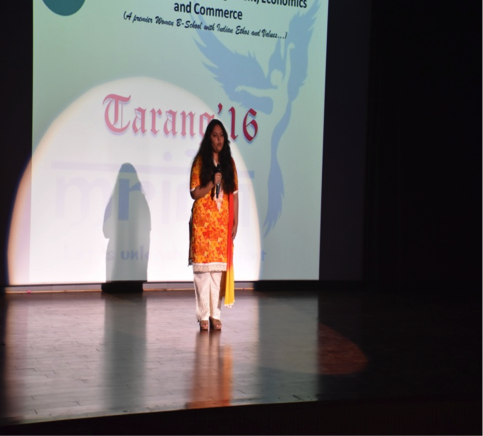 MRIDA, the Cultural Society of COBMEC organized a cultural event Tarang on 26th November 2016 in Sangeet Samrat Tansen Sabhagar (Mini auditorium). Students were divided into 4 houses namely Pink (Rhodonite), Orange (Carnelian), Purple (Purple Garnette) and Blue (Sapphire). The event comprised of 8 competitive activities namely Just-In-Two, Group Dance, Stand-Up Comedy, Cook Without Fuel, Mime, Singing, Explore Your Talent And Ad Mad Show. The evening began with the lamp lighting ceremony by the President of the University, Dean and the Associate Dean with the Ganesh Vandana being played in the background. 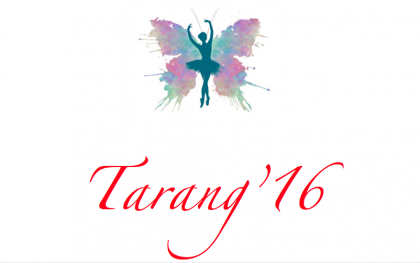 The first performance was a dance presented by Ms. Sindoori Choubey and Ms. Shivangi Dhaka. The first activity was Just-in-Two where the students showcased a story in 2 minutes. The first performance was by the participants of Pink house where participants portrayed the relationship between parents and the child followed by the performance by the participants of Purple house where the participants depicted the relationship between a father and a daughter. Next performance was by the participants of Orange house and Blue house. The first position in Just-in-two was bagged by Pink house. 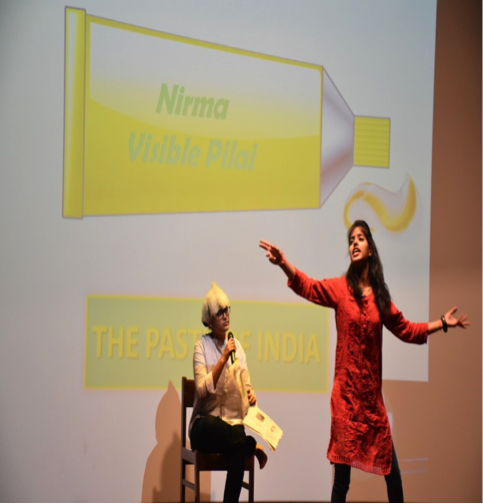 Second activity was Mime where the participants had to depict the modern and traditional India. Next activity was ad-mad show. The students showed the product with a different perspective. The activity was followed by Explore the talent round where the participants stepped out of their comfort zone. Participants performed various activities like nail art, sand art, sketching and whistling in one minute. First position was bagged by Orange house where Prerna Sinha whistled the tune of National Anthem. Next activity was Group Dance where the participants performed different types of dances. 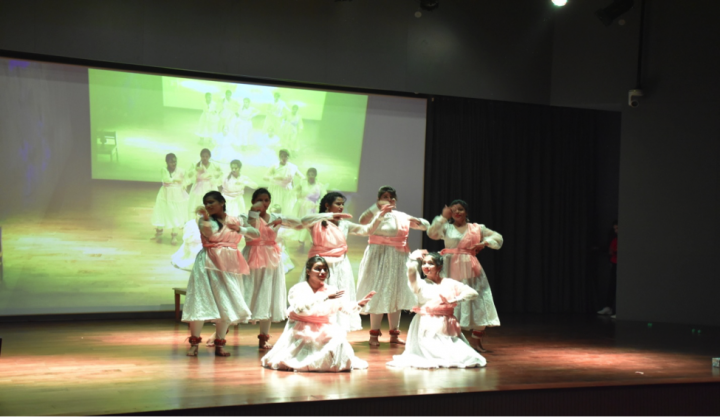 Pink house depicted the life of Meera through the dance followed by a dance by the participants of Purple house depicting the nature of purple color. First position was bagged by the Pink house. The next activity was cook without fuel where the students had to cook without the use of any electric items or fuel within 25 minutes. The participants from different houses prepared different types of delicious items like Mojito, Choco Balls, Fruitpan and Creamy Spheres. The first position was bagged by the Purple house where the participants had prepared Choco Cano, C2 Bites, Creamy Spheres, Bao-Bao and Swad-E-Alam. The last activity was Stand-Up-Comedy. The participants tickled the audience with the best of their comic skills. The first position was bagged by the Blue house. Prizes were awarded to all the winners and the runner-ups. The all-rounder trophy was bagged by the Pink House (Rhodonite). The team was led by Ms. Divya Pareek(Team Leader). 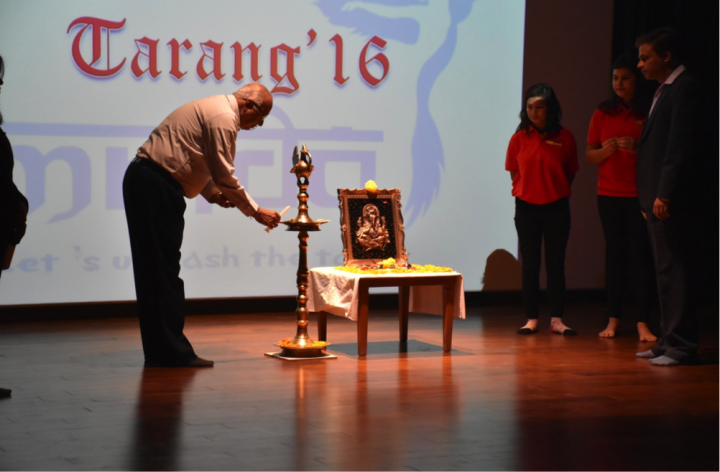 The event was witnessed by the faculty members, non-teaching staff and students.